How to choose the correct size chandelier? 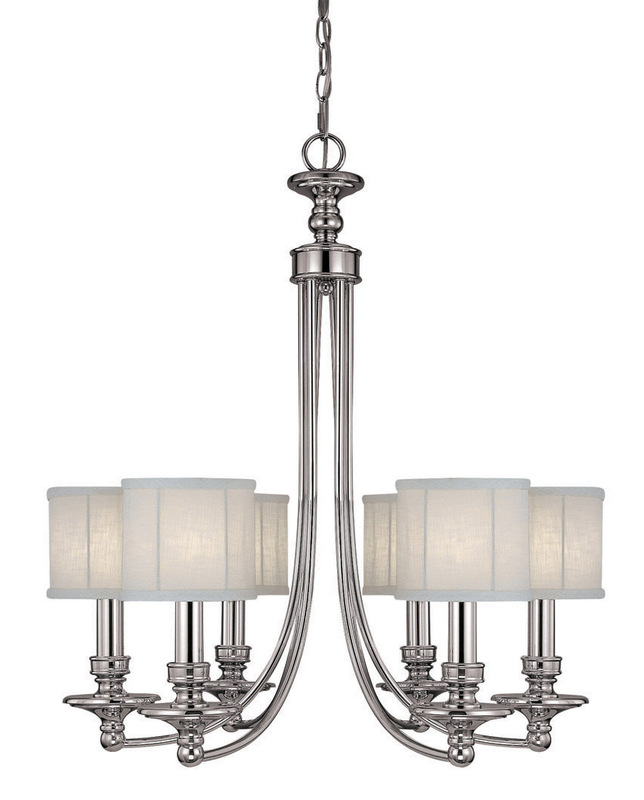 To choose the correct size a dining room chandelier, add the overall length + width of the room together and convert the answer from feet to inches. For example: A 12' x 14' dining room should have a 26" diameter chandelier. The proper height to hang a dining chandelier is between 30-36" above the table on an 8' ceiling. If your ceiling is higher than eight feet, you may raise your chandelier a couple of inches in order that it looks correct within the space. A bowl style pendant should also be hung a couple of inches higher than normal so that you look slightly up at the bowl and not into it. For ceilings nine feet or higher, consider a two-tier style chandelier to fill the space from the fixture's top to the ceiling. Please note that you should rarely use a chandelier larger than 36” diameter over a rectangular dining table. Most dining tables are approx. 42-44” wide, and if the chandelier is too close to the edge of the table, there is a chance of bumping it when one gets up from their seat. In the event the ceiling is very high, as is the case in a "Great Room", the chandelier can be larger and hung higher - treating the space more like a large foyer as opposed to a dining room. How do you clean a crystal chandelier? Use a solution of 1/3rd vinegar to water on a damp cloth. This method will properly clean your crystals without affecting the finish of the fixture. When turning the chandelier, always turn 180 degrees one way, then return to original position; then turn the other way. This will ensure you don't unscrew the chandelier from the threaded mounting rod. 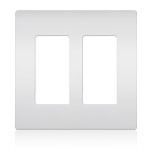 You can match your dimmers and switches to your decor, and choose plates without screws for a clean finished look. Colour Swatches are available in the showroom. Properly lighting the outside of your home is just as important as the interior. Our lighting consultants can show you how to subtly accent trees, pathways and architechtural elements that will enhance the appearance of your home and the backyard. Installing a motorized chandelier lift enables you to clean and re-lamp your fixture whenever it is convenient. This eliminates the need to call a contractor and erect costly scaffolding in your entryway. Lifts can pay for themselves in only a few uses. The motor assembly is mounted above the ceiling, normally in the attic, and is not visible. They may be installed in new or existing homes. For maximum safety, the electrical current to the light fixture is disconnected once it is lowered. The supplied key switch is child resistant and prevents accidental activation of the motor. The lift includes* a test-plug which allows the homeowner to power the chandelier when it is in the lowered position by simply plugging into a wall outlet - so as to see which bulbs need changing. A dimmer may be used as long as the motor is wired seperately. * The test plug is included with our stock 300 lb. lift and is optional on others. These motorized lifts should be installed by a liscenced electrician. View our stock unit's Motorized lift Installation instructions. Incandescent Bulbs: 750 - 5,000 hrs. Compact Flourescents: 5,000 - 15,000 hrs. 1. Use a bendable Rail System - The power supply can be installed anywhere along the rail, simply bend the rail to center the system above the table. Hang some pendants or spots and you're done. 2. If the outlet is only off by a few inches, move it over. Then cover the new outlet with a medallion large enough to cover the old hole. This is an easy fix, and you avoid replastering and painting. 3. If your ceiling is not concrete, you can go to the extent of moving the outlet box and patching and painting the ceiling. Ceiling fans come in many styles and finishes to suit any decor. Here are some basic tips on choosing your fan. Choose a better quality fan. They will not wobble or hum much, if at all; and they tend to have larger motors so the blade pitch can be greater and will move more air. Check your electrical box. Mounting a fan on a well secured box or fan brace will greatly reduce wobble. Most electrical ceiling boxes are wired for light fixtures and contain only one circuit. That's OK if you don't need a light and a fan controlled separately. Some fans have pull-chains to independently control light and fan functions; some are equipped with remote or wall controls that send signals to a switching circuit within the fan - this is a slightly more expensive option. One thing to note: never use a lighting dimmer to control your fan - they are not rated for motor loads. The direction of the fan should be reversed in winter time. In summer it should go forward or counter-clockwise, and the opposite in winter in order to move warm air down off of the ceiling. This will help circulate the warm air and reduce heating bills. When positioning your fan, ensure the blades are not near existing light fixtures such as recessed lighting as this will cause a strobe effect. The height of the ceiling fan is determined by the height of the room. A ceiling fan's blades should not be lower than 7' 9" from the floor (this is roughly the height using the small downrod supplied with most fans). Here is a calculation you can use to determine downrod length: Calculate the height of the ceiling minus 10 feet, and divide by two, than add one foot. (So, on a 16' ceiling, take 16ft-10ft which is 6 feet. Half of 6 feet is 3 feet, then add a foot to make 4 feet. This is the size of downrod you require: 4ft rod on 16ft ceiling.) This calculation works up to about 20 foot high ceilings, which would use a 6ft downrod. In cases where, for various design reasons, you would like the fan lower, you can safely come down to a minimum of 10 feet of the floor for higher ceilings. Be careful using an indoor fan in a damp location (such as an indoor spa/pool area) as the components are not designed to withstand the moisture. For these and exterior areas, use a fan rated for exterior use. These fans are designed to be weatherproof and have composite blades that will not warp or rot. To avoid glare from high wattage bulbs, use shades, or dimmers. Add recessed low voltage lights ¼ the way in on each end of the table. These halogen pot lights will brightly illuminate china and crystal and the chandelier can be dimmed to a comfortable level. This layered effect will make the room more comfortable and your crystal and centerpiece will “pop”. Use similar low voltage recessed lights to illuminate artwork in the room and highlight these focal points. Wall sconces should be mounted an average of 66” above the floor. (This can vary depending on the size/configuration of the piece). For bathrooms, use sconces either above or beside the mirror so that shadows on your face from overhead sources will be eliminated. Bedside wall lamps should be about mounted roughly 22” above the mattress surface. American Leather's Comfort Sleeper™ is a home furnishings jewel. A sofa bed that is just as comfortable for sitting as it is for sleeping. Rated as “Best Value” by Consumers Digest, our Comfort Sleeper features the patented Tiffany 24/7 platform system topped with five inches of luxury high density foam. Sit or sleep with total comfort, with no bars, no springs and no sag. The only sleep sofa available with an optional Tempur-Pedic™ mattress. The world’s best sofa sleeper pairs with the sleep system that’s out of this world with comfort. Originally developed by NASA scientists, a Tempur Pedic™ mattress conforms perfectly to your body, allowing your shoulders and hips to sink into the mattress just enough so that support is provided along your entire body. Allergen-free, waterproof and stain-free with our exclusive Crypton® fabric mattress cover. Our soft, white mattress ticking is protected by Crypton, a remarkable fabrictechnology that is anti-microbial, allergen-free and a barrier to dust mites. The waterproof and stain proof covering adds years to the life of the mattress and ensures that the bed is fresh every time you open it. Dust barrier prevents dirt or dust from every touching the mattress. Every Comfort Sleeper is protected by a cloth under shield. When guests arrive, your Comfort Sleeper mattress will fold out without any dust bunnies clinging to the mechanism. they’ll never experience a cleaner sleep. Choose leather, fabric, Ultrasuede or microfiber. Never compromise on style with a huge choice of coverings. Wood will expand and contract as seasons and humidity change. Expanded joints will eventually return to normal. Keep furniture away from heating/cooling vents to avoid humidity issues. Sunlight is extremely damaging to wood and fabric. Keep items away from direct exposure to protect the finish and colour. Avoid leaning back on chairs so the front legs are off the ground. This will not ony protect the occupant, but will ensure joints do not come loose as pressure will bear on the hind legs. Use of protective covers is suggested - especially in dining areas. Table pads and place mats will help protect the finish. CAUTION: some synthetic and rubber contain chemicals that will leave a residue and discolour the finish. Dining table leaves should always be stored flat to avoid warping. Ensure two people open.close the table and remove the leaves for added safety. Avoid dragging table legs. Beds should be disassembled before moving them in order to avoid damage of the component parts. If doors or drawers are becoming stuck, check and adjust door hinges and leg levelers as soon as possible to avoid damage. Be sure to use a clean, lint free cloth when dusting furniture. Apply Guardsman Revitalizing Wood Polish twice a year to help protect the finish. Unlike some polishes, Guardsman polishes contain no waxes, abrasives or silicones and leaves no greasy film or buildup. Enjoy your furniture without worrying about accidental stains or damages. The Guardsman® Gold In Home™ Furniture Protection Plan provides you that peace of mind. • Gold In Home™ covers practically every type of furniture, including wood, leather, fabrics, and hard surfaces like laminates, glass and metal. • The Plan offers five years of protection against accidental damage, including stains, gouges, tears, burns, water marks, and more. * If the result of a single incident. ** Hard surfaces include metal, glass, mirrors, laminate, stone, wicker, rattan and other hard, non-wood surfaces. Refer to the Gold In Home™ Furniture Protection Plan for complete coverage details. Simply register your Gold In Home plan upon receipt of your furniture. There is a registration form in the carton of Guardsman cleaning products you receive when you purchase the Gold In Home plan. If damage covered by your Guardsman plan occurs during the term of the plan, report the damage within 5 days of occurrence. Contact Guardsman by calling (877) 584-GOLD, or by filing a Service Request at guardsman.com. (Have a copy of your sales bill and your Protection Plan ready). A technician will be sent to your home to repair the covered damage. In the unlikely event the damage cannot be repaired (the technicians are successful almost 90% of the time), they may replace either the damaged part or the entire piece of furniture at no additional charge to you. If you initiate your claim by phone, you will be mailed (or emailed) a claim form; if you initiate your claim online, you will be asked to print the claim form. That claim form must be fully completed, signed, and returned to Guardsman along with documentation of your purchase within 30 days of your initial report; you may also be asked to provide photographs of your damaged furniture, which will enable them to determine the right solution to your problem. Guardsman uses the information on your form and other information to decide how to respond to your claim and to provide you with the most efficient service possible. Within a few days of receiving your completed claim information, the repair professional selected by Guardsman will contact you directly to schedule an appointment to visit your home. You will know who is coming to your home, and when they will be there. Teak is a close grained hardwood with a high natural oil content. This makes it hard wearing, highly resistant to rotting and almost impervious to the effects of sun, rain, frost or snow. These characteristics combine to make it the ideal timber for all outdoor applications. Many other hardwoods are used for outdoor furniture and some are even marketed as 'teak substitutes'. However, there is no substitute for teak and no other hardwood will perform to the same standard as teak in outdoor conditions. The teak plantations on Indonesia are really no different than any other crop, except that the growing cycle is far longer. Plantation teak is inherently more environmentally friendly than natural forest timber because no teak trees existed until the plantations were established and, due to their careful management, trees are constantly being planted at a rate that exceeds those being felled. Most importantly, the plantations in Indonesia are actively managed to be a sustainable system which not only has low impact on the eco-system, but is also fully integrated into the Indonesian social system and maximises local employment. Teak is an exceptionally stable timber once it has been properly seasoned and by far the most effective means of seasoning teak is to dry it in a kiln. A teak tree prior to felling has a moisture content of over 60%, but for furniture manufacture, this needs to be reduced to just 8-10%. We have our own kilns on-site at our factory and, depending on the dimensions of the cut pieces, it can take weeks or even months to correctly reduce the moisture content to the desired level. Kiln drying the timber is important as it not only enables us to craft accurate, close fitting joints and thus ensures the stability of the finished furniture in a variety of environments - frost and snow in winter to rain and sun in summer. Furniture that is not made from kiln-dried teak can quickly begin to warp and split when left outside and can ultimately fail all-together. What is so special about the way Gloster makes teak furniture? Many things make our teak furniture exceptional. For example, the joints used are specifically chosen to provide the strongest means of joining the component parts together. Thanks to the use of kiln dried timber and our modern wood-working machinery, these joints are made to extremely tight tolerances, which means that they are always a perfect fit and there are no visible gaps between two pieces of joined wood. In addition, we use a variety of different high-performance adhesives in the construction of the furniture. Teak does not require any special maintenance routine apart from occasional cleaning. If left to age naturally outside by being exposed to light, air and rain, then the surface of the teak will gradually change to a soft, silver-grey as the pigments in the surface layer of the wood start to fade away. We recommend that you simply allow your furniture to weather naturally this way and maintain the silver patina with regular cleaning using Gloster Teak Cleaner. If you want to get extra protection against stains, use Gloster Teak Protector and to maintain the golden brown of new teak, apply Gloster Teak Sealer to your furniture from new. IT IS NOT RECOMMENDED TO USE PROTECTIVE COVERS ON TEAK FURNITURE AS YOU CAN ENCOURAGE THE DEVELOPMENT OF BLACK MOLD SINCE THE WOOD NEEDS TO BREATH. If you want to store your furniture over the winter, we advise that you do so in a garden shed, or garage. However, we advise that you do not move teak furniture from the garden straight into a heated indoor room for storage, as the sharp differences in temperature and humidity may cause the wood to split. There are some simple things you can do to extend the life and appearance of outdoor cushions and umbrellas. If you use outdoor cushions, they should be taken inside or placed in a storage box when not in use. Alternatively, if your furniture is woven or metal (not teak), you may use protective covers to keep your cushions dry and extend their life. Most outdoor fabric is solution dyed, meaning the pigment runs all the way through the fiber. This process is an important step in making the fabric fade resistant. It is not fade proof. Leaving any fabric outdoors unprotected will bake in dirt, bleach them from the sun's rays, and could encourage mold to form from dampness. If cushions do get wet, it is best to prop them up on their sides and open the zipper at the bottom edge to allow for drainage and air to dry the interior of the cushion. Umbrellas too, can be covered to extend their appearance. In addition, umbrellas should be closed when unattended and not in use. A heavy wind could damage the structural frame or, in severe cases, pick up an open umbrella which can cause damage to it and anything in the area. Union gift certificates are available in any denomination you choose.